Cerebral palsy is a group of disorders that can involve brain and nervous system functions, such as movement, learning, hearing, seeing, and thinking. There are several different types of cerebral palsy, including spastic, dyskinetic, ataxic, hypotonic, and mixed. Cerebral palsy is caused by injuries or abnormalities of the brain. Most of these problems occur as the baby grows in the womb. But they can happen at any time during the first 2 years of life, while the baby's brain is still developing. In some people with cerebral palsy, parts of the brain are injured due to a low level of oxygen (hypoxia) in those areas. It is not known why this occurs. In some cases, the cause of cerebral palsy is never determined. Symptoms are usually seen before a child is 2 years old. Sometimes symptoms begin as early as 3 months. Parents may notice that their child is delayed in reaching developmental stages such as sitting, rolling, crawling, or walking. 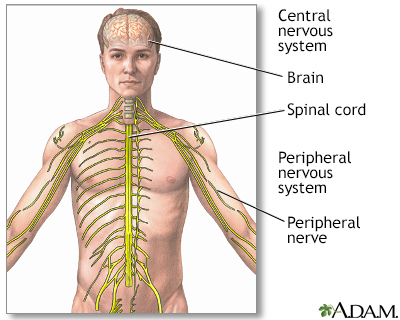 There are several different types of cerebral palsy. Some people have a mix of symptoms. Muscles that are very tight and do not stretch. They may tighten even more over time. Abnormal walk (gait) -- arms tucked in toward the sides, knees crossed or touching, legs make "scissors" movements, walk on the toes. Joints are tight and do not open all the way (called joint contracture). Muscle weakness or loss of movement in a group of muscles (paralysis). Symptoms may affect one arm or leg, one side of the body, both legs, or both arms and legs. The health care provider will perform a full neurologic exam. In older people, testing cognitive function is also important. There is no cure for cerebral palsy. The goal of treatment is to help the person be as independent as possible. Treatment is based on the person's symptoms and the need to prevent complications. Putting the child in regular schools is recommended, unless physical disabilities or mental development makes this impossible. Special education or schooling may help. Physical therapy, occupational therapy, orthopedic help, or other treatments may also be needed to help with daily activities and care. Stress and burnout among parents and other caregivers of cerebral palsy patients is common. Seek support and more information from organizations that specialize in cerebral palsy. Cerebral palsy is a life-long disorder. Long-term care may be required. The disorder does not affect expected length of life. The amount of disability varies. Many adults are able to live in the community, either independently or with different levels of help. Call your provider if symptoms of cerebral palsy develop, especially if you know that an injury occurred during birth or early infancy. Getting the proper prenatal care may reduce the risk of some rare causes of cerebral palsy. In most cases though, the injury causing the disorder is not preventable. Pregnant mothers with certain medical conditions may need to be followed in a high-risk prenatal clinic. Colver A, Fairhurst C, Pharoah PO. Cerebral palsy. Lancet. 2014;583(9924):1240-1249. PMID: 24268104 www.ncbi.nlm.nih.gov/pubmed/24268104. Johnston MV. Encephalopathies. In: Kliegman RM, Stanton BF, St. Geme JW, Schor NF, eds. Nelson Textbook of Pediatrics. 20th ed. Philadelphia, PA: Elsevier Saunders; 2016:chap 598. Nass R, Sidhu R, Ross G. Autism and other developmental disabilities. In: Daroff RB, Jankovic J, Mazziotta JC, Pomeroy SL, eds. Bradley's Neurology in Clinical Practice. 7th ed. Philadelphia, PA: Elsevier; 2016:chap 90. Oskoui M, Shevell MI, Swaiman KF. Cerebral palsy. In: Swaiman K, Ashwal S, Ferriero DM, et al, eds. Swaiman's Pediatric Neurology: Principles and Practice. 6th ed. Philadelphia, PA: Elsevier; 2017:chap 97. Verschuren O, Peterson MD, Balemans AC, Hurvitz EA. Exercise and physical activity recommendations for people with cerebral palsy. Dev Med Child Neurol. 2016;58(8):798-808. PMID 26853808 www.ncbi.nlm.nih.gov/pubmed/26853808. Amit M. Shelat, DO, FACP, Attending Neurologist and Assistant Professor of Clinical Neurology, SUNY Stony Brook, School of Medicine, Stony Brook, NY. Review provided by VeriMed Healthcare Network. Also reviewed by David Zieve, MD, MHA, Medical Director, Brenda Conaway, Editorial Director, and the A.D.A.M. Editorial team.